If you go to a local bikes shop looking for the best mountain bikes under a $1,000, the salesman will probably wrinkle his face in a dismissive manner and tell you that if you want something good, you’re going to have to pay about twice that amount. You can make the mistake of believing him and going along with his proposal. But really, unless you’re riding on very rough roads or in challenging competitions you can get a very good mountain bike for your money. However, those mountain bikes will bring you to the next level on the mountain biking scene! There are bikes to be found under a $1,000, that is reliable, long-lasting and require no more maintenance than any other good bike. 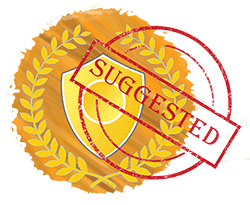 Though because these can be time-consuming to search out, I’ve gone through the trouble of picking out the best candidates, evaluating them and putting together reviews for the best of them. These are the best mountain bikes under $1,000 of 2019. Pick your size and enjoy! The Orbea MX 10 just begs to be taken out and ridden hard! Are you the kind of guy (or girl) to do that? If you feel that you have “outgrown” your current entry-level mountain bike and that it cannot keep up with your developing skills, it’s time for an upgrade! 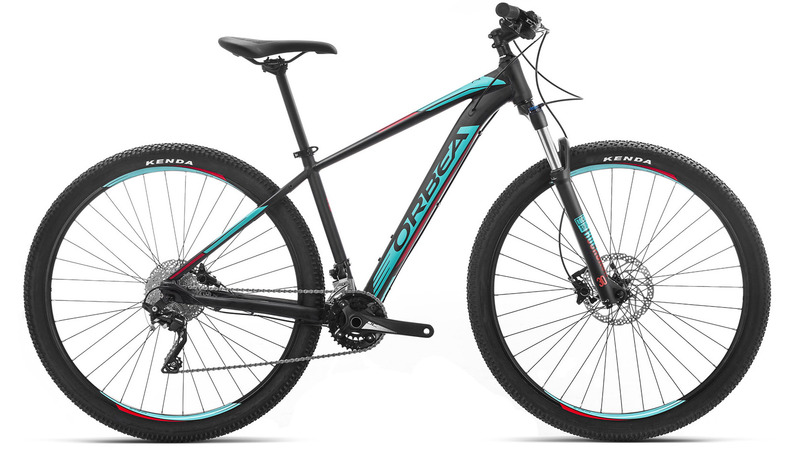 The Orbea MX 10 is a fantastic mid-range mountain bike that is an exceptionally good value for the $1000 that you cash out. It’s built around a super-lightweight aluminum frame produced by the Basque company that does sacrifice durability to shed off a couple of pounds. It’s available in two attractive color-combinations: black-turquoise and pistachio-black. The Orbea MX 10 also comes with a suspended air front fork produced by Rock Shox. It has a 100mm travel and a remote lockout. The absolute highlight of the MX 10 is its Shimano components, specifically the rear derailleur. While the shifters and the front derailleur are from the pretty decent Shimano Deore groupset, the rear derailleur is an XT. This combo provides smooth shifting in all conditions and on all terrain and is the quality class that is expected for this price. Moreover, the Orbea MX 10 is designed for rugged terrain which is obvious because of its 2×10 drivetrain. The 20 gears total will allow you to go fast, but also to tackle the steepest hills in the area. Moreover, the 29” tires will bite firmly into the ground whatever the terrain. Feel free to push hard on the pedals because the 2.35” wide Kenda tires will not slide but propel you forward. Of course, you also need to stop but there’s no need to worry about that. As is fitting for a true mountain bike, the Orbea MX 10 comes with Shimano hydraulic brakes and brakes don’t get much better than that. Other aspects of the Orbea MX 10 worth mentioning are the Selle Royal 2062 saddle and the fact that it comes with no pedals. So, if you’re looking for a multi-functional cross-country bike, fit it with pedals of your choice and ride away! 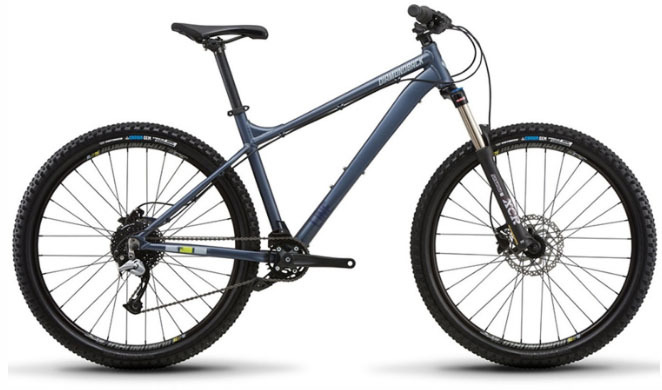 Co-op Cycles DRT 1.2 is a versatile hardtail trail bike that’s a product of REI. It has a pretty affordable price, so it’s intended for recreational riders and those who do not yet have too much experience on the trails. DRT 1.2 boasts numerous qualities, the first one of which is the durable, yet lightweight, Co-op Cycles aluminum frame. It’s available in just one color, Army Cot Green, which fits perfectly in all natural surroundings. Some additional important aspects of DRT 1.2 include 27.5″ wheels, riser bars, internal cabling, and a weight of just 31 lbs. This bike is classified as a unisex model, even though there is also a women-specific version of it. However, there’s no reason why women could not ride this model as well; you might have to change the seat, but that’s not a big expense at all. Apart from all the positive features that we have already mentioned above, the Co-op Cycles DRT 1.2 has other things that work in its advantage. First of all, it has an SR Suntour XCR Dual Piston fork with remote lockout and an impressive 120 mm of travel. It’s clear that this bike is capable of a lot when the going gets tough on the trails. By purchasing the DRT 1.2 bike, you will also get a set of Shimano derailleurs and shifters. The rear derailleur is a Deore, whereas the front is an Altus. Moreover, you will also get 27 diverse gears on a 3×9 drivetrain that’s made from an Alivio cassette and an Acera crank. As you can see, the DRT 1.2 is a “Shimano-stein,” but all of these parts work in harmony with each other, as all of them are built by the same company. Braking on the 1.2 is powerful and efficient, thanks to a set of Tektro hydraulic disc brakes. They behave really well in all conditions, including rain, snow, mud, and loose gravel. 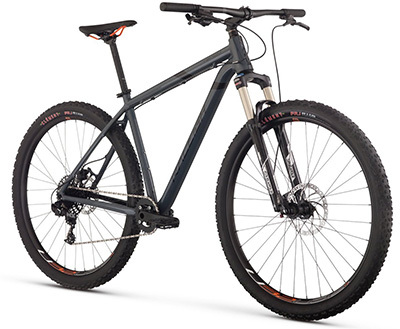 To add to that, the it has a pair of trail-specific 2.2″ wide tires and sturdy Co-op Cycles aluminum wheels. Riders who own this bike claim that they offer plenty of traction and grip on rides. Clearly, the DRT 1.2 is not intended for experienced riders who abuse their bikes on a regular basis. However, it is one of the best options for recreational riders and trail enthusiasts who want a reasonably-priced bike that will justify its worth on moderate trail rides and off-road weekend trips. 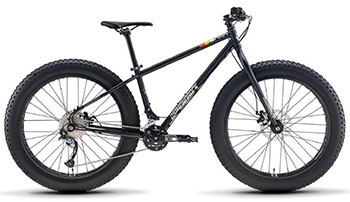 Fat bikes are basically tanks on two wheels and Diamondback El Oso Uno is no different. This fat bike can take you over sand, rocks, and snow with ease because of its 4” tires. The wide tires also make El Oso Uno very comfortable and the upright riding position just adds to it. A fat bike is a perfect companion for long off-road tours where you’re going to spend hours in the saddle every day. Your bum and your joints are not going to feel a thing! However, the Diamondback El Oso Uno has other things to boast of as well. For example, its steel frame and fork are sturdy, durable, flexible, and practical at the same time. If you’re cycling far into the wild and something happens to your frame, steel frames are the easiest to repair and you’ll be happy to have one. It puts El Oso Uno on the heavier side, but the 37 lbs. 15 oz. is not that heavy considering that it is fat. As far as technicalities go, the Diamondback El Oso Uno has 18 (2×9) pretty easy gears so it won’t be the fastest bike on the trail. However, it will be the most functional and the most versatile bike for sure. The groupset is made by Shimano, which is great, but the quality classes could be a bit higher considering that it is a $750 bike. The front derailleur is a humble MT400, while the shifters and the rear derailleur are the standard Shimano Acera. But, to be honest, a fat bike is not built for wild extreme rides, but for covering large distances and tackling hard terrain, and Shimano Acera will allow you to do that. The brakes are Tektro Novela mechanical disc brakes which have proven to be pretty decent. The Diamondback El Oso Uno also comes with a DB Race M-series saddle and DB4L alloy platform pedals. Finally, this is a unisex bike, so no matter if you’re a guy or a girl, and you’re looking for a bike that can support your off-road adventures, you should definitely give the Diamondback El Oso Uno a try! This Diamondback Line does have a lightweight alloy frame with a stylishly fancy design. It’s the first thing that you’re going to notice. But If you look closer, you can see that it has pretty decent parts as well. I usually suggest 29” wheels on my reviews if you’re taller than 5’8”. However when you’re smaller, then 27,5” is a better option for you. Diamondback bikes have good geometry. What makes this bike into the TOP 3 of best hardtail mountain bike under $1,000 is the fact that it has a decent set of components. It is more popular that bikes that have 1 chain-ring in front because of the higher reliability they add. The less moving parts are the better. Of course, no need to mention, it has hydraulic disc brakes. But what is worth mentioning is the 120 mm front suspension. From somewhere around $1,000 mountain bikes begin to have 12 cm front suspension. Why is the 120mm one better? Can’t say that 100 mm is worse than 120 mm, as the latter one gives you more travel when riding on tarmac. Suntor isn’t the best suspension manufacturer but we must keep in mind that good forks start at $500 and our aim is to find the right balance between price and quality. It has 9 gears thanks to Shimano Acera M3000 derailleur. It means one ring at the front and 9 on the rear. And that’s just enough. I wrote above why it is good. The Line weighs around 30 lbs. When talking about the front fork, this bike has 15 mm Thru Axle. It basically means that it goes through the front wheel and provides better security than the Quick Release one that most bikes have. You can check more about that in this Youtube video. This bike doesn’t have many reviews which is a shame. It’s such a nice bike in many aspects! I must be honest, Raleigh bikes were something I didn’t know much about in mountain bike scene a few years ago. I’ve started to see this bike more and more often and now, it’s the first Raleigh bike which has found its way into my bike guide. Raleigh has been making bikes since 1885 and their bikes are getting more and more stylish. The spec list is stunning on this Raleigh. The frame is 6061 Aluminum, like all of the bikes in this range. If you find a carbon frame for under $1,000, then I would really consider staying away from it and choosing this instead. This is because I’ve seen many bad reviews about those cheap carbon frames. The front fork is SR Suntour Raidon with 100mm of travel, and lock-out / Rebound control. However, it doesn’t allow too much adjustment. Although that doesn’t mean that this fork won’t offer you the great performance! It will, and lots of fun too. The components are mainly SRAM. The rear derailleur and shifters are SRAM NX, which are mid-level components. Will they last? Yes, if you take care of your bike and don’t push too hard. You can always upgrade the components if you want a lighter and more reliable set. Like many of the bikes, this Raleigh has some of its own Raleigh components. For example the handlebars, grips, stem, seat, and seat post. Rims – It’s a 29er, which means it has 29“ diameter rims. This is a widely spread size nowadays. The manufacturer of the rims is Weinmann. This manufacturer is quite new to me, but I did the research (like always) and found out that they make low- to mid-level products. However, if you are taking your rides to next level, you might want to buy something lighter. Nice find for the money! It uses quality SRAM components, but on the downside, it uses heavy rims. This bike is suitable for riders with medium standards, or for riders, who are going to upgrade the wheels. By doing this, you’ll get a bike with good components, which will do well for many great years. Whether you are just taking your first steps in mountain biking or you already have some basic experience and skills, Cannondale Trail 7 is a bike that you should consider. This lightweight two-wheeler will be your best friend on the trail and fill you with confidence. It is nimble, speedy, and responsive, so you will have no trouble controlling it during rides and pushing your limits. The Cannondale Trail 7 is an affordable bike with a great money to value ratio, so you will not throw your money down the drain if you decide to buy it. Trail 7 is a fairly lightweight bike, considering its price since its total weight comes down to just over 31 lbs. This can be credited to the aluminum frame which offers decent stiffness and balance, but also smoothness on rough rides. On the front, it is equipped with a Suntour suspended fork with 100mm of travel and a lockout function as well. Even though it’s not top of the line, you’ll have fun cruising over bumpy terrain without any problems with this suspension. As far as components on Cannondale Trail 7 go, they are a combination of Shimano Altus and other Shimano quality groupsets. The main drawback that users point out in reviews online is the Shimano Altus rear derailleur. It will work and be able to take you out on the trail; however, you might have to adjust it a bit more often than a high-end model. However, if you keep your chain and drivetrain clean, you shouldn’t experience any big issues. Talking about the drivetrain, Cannondale Trail 7 has 18 speeds in a combination of 2×9. The cassette has a range of 11-36 teeth, while the crankset is a 22-36. This provides plenty of range to tackle even the most stubborn hills and finally reach the downhills. On the downhills, if you need to break hard, you can trust the quality Shimano hydraulic disc brakes, with Shimano 160mm rotors both on the front and on the back. This is a great choice for Cannondale Trail 7 and it will definitely give you lots of confidence when descending. The tires are WTB Ranger Comp available in 27.5” and 29” versions and 2.25” in width, so you can make your choice. The bottom point is that the Cannondale Trail 7 is a great entry-level mountain bike that any beginner or cycling enthusiast will enjoy and never regret buying. if you’re looking for a multi-functional cross-country bike with great value, the Orbea MX 10 is the one for you. But if you are looking at the best trail mountain bike for under $1,000, then the DRT 1.2 is also a smart choice. For mountain bikers who prefer 29” wheels, the Raleigh Tekoa Comp will be the best pick. It has a decent set of components which we think are a stand-out among bikes in this category. Conversely, if you don’t mind lower-end suspension/components for a cheaper bike price, the Diamondback Line would be the best pick. Another consideration here is the additional suspension travel – 120 mm vs. the typical 100 mm. The Cannondale Trail 7 sells pretty well also, so you should consider it. It has 27.5″ and 29″ tires. Probably the best fat bike under $1k that you can find on the market right now is the El Oso, so there’s no reason to hesitate. What about best full suspension mountain bike under $1,000? Sorry, you can get one but it’s not the “best” you are looking for. You might want to read this review of best full suspension mountain bikes. Hope it helped! Enjoy your ride!